Take a look backstage with O Beach Ibiza’s aerialist Yanelis Vives ! O Beach Ibiza isn’t just known for its award winning pool parties but also for it’s spectacular array of production and entertainment! 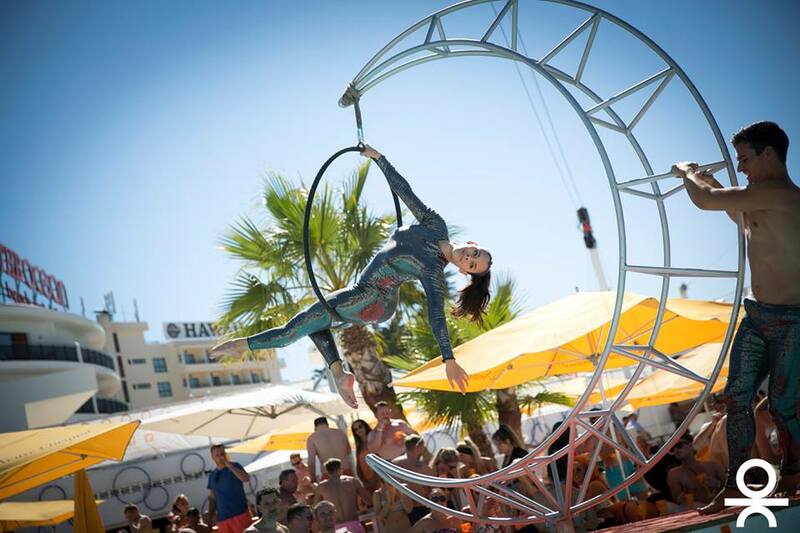 With our aerial and silk shows being our most talked about performances each year we thought we’d catch up with aerialist Yanelis Vives about her time here at O Beach Ibiza! Tell us a bit about yourself and how you became a performer? I started gymnastics from quite a young age, I did it for nearly eight years before I started dancing and training at an art s chool back in Cuba. I trained really hard for four years there and then I decided I really wanted to learn contortion! After many years of hard work and dedication I’m here! Now I train several times a week at a sports centre in Ses Paisses, which isn’t too far from Ocean and is perfect for me to practice my routines and aerial acts. When I arrive at Ocean, I head straight to the dressing room for hair and make-up. I’ll then begin preparing myself for the shows with specific stretches and warm up techniques. Then i’ll get myself into costume and head out to perform. What is your favourite event to perform at at Ocean beach ibiza? Friday’s pool party and Hed Kandi on a Monday are my favourites! They’re both really popular days so they have great atmospheres and I love being able to interact with the customers which makes performing even more fun ! My biggest challenge has to be leaving my family back in Cuba to start a new fresh opportunity here In Ibiza. When you start training you need to be dedicated and you have to maintain that no matter how hard it gets. It’s a really tough career that takes a lot of commitment and sacrifice but in the end it’s all worth it to be able to do something you love ! With only one week left of the season make sure to get your tickets and beds at WWW.OCEANBEACHIBIZA.COM and catch Yanelis in all the action!